In a comparison done internally, the country's largest community college system found that it is the most successful in supplying college access to needy students. California Community Colleges, with 113 colleges serving 2.1 million students per year, examined eight programs, including the federal America's College Promise proposal. The research was conducted by Stacy Fisher, a research specialist in the Chancellor's Office's division of Technology, Research and Information Services, and recently published in a report, "The California Community Colleges Board of Governors Fee Waiver: A Comparison of State Aid Programs." The issue of free tuition for the first two years of college education has come to the forefront, said Fisher, because multiple state and local programs have been implemented, and President Obama included the America's College Promise proposal in his January 2015 State of the Union address. The project compared California's Board of Governors Fee Waiver to aid programs in six other states as well as the proposal. 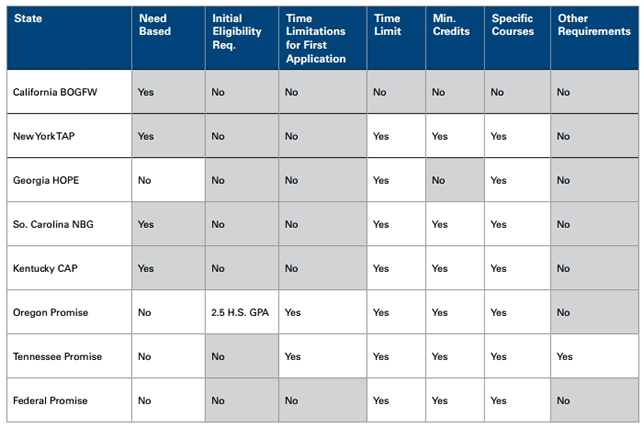 Eligibility requirements of state student aid programs. Source: California Community Colleges Chancellor's Office report, "The California Community Colleges Board of Governors Fee Waiver: A Comparison of State Aid Programs." Aid should be designed for both access and success. While the principles "appear fairly easy to agree upon in theory," wrote Fisher, " in practice they "contradict one another and generate significant conflict." As an example, where states require the student to enroll in a certain level of credit hours, that could "erect a barrier" for needy students who must work full time to support their families. The same stipulation, however, "may generate student success because it incentivizes students to get through their programs more quickly." California's fee waiver program was created in 1984 to offset the impact of an enrollment fee implemented that year for its community colleges. Up until then the community colleges had charged no tuition or fees, a practice that had become insupportable with the budget limitations created by the infamous Proposition 13. Even as the law mandating a fee for college was passed in the state, the same law waived it for underrepresented and low-income students. Against the five criteria, California's program was found to be more accessible to needy students than any of the others examined. What makes it stand out, the report stated, is that "the combination of all of its features makes it the most consistent with the recommendations in the College Board's report." About 1.1 million students in California are now receiving the fee waiver. The state's application and eligibility process is fairly straightforward and more flexible than other states, according to the research. Additionally, the share of historically underrepresented students who receive the waiver is on the rise. While African Americans and Latinos as a share of the state's population is 45 percent, those students represent 58 percent of the total receiving the waiver. However, one important aspect of the fee waiver still needs more attention: its relationship to student success, which "remains unknown." The state hopes to obtain such evidence when current changes underway in waiver eligibility have been "fully implemented." That data won't be available until the end of the 2020-2021 academic year, Fisher noted. "At that point, California will have data from the first natural experiment to test the impact of such standards on completion rates, providing insight into how aid can be designed to increase student success."